San Francisco, CA 11/5/10 - Organic Food Club will be exhibiting in booth 437 at the Green Festival on November 6 and 7, 20l0. A project of Green America and Global Exchange, Green Festival is the Nation�s Premier Sustainability event and is taking place this year at the Concourse Exhibition Center on 8th St in San Francisco. Organic Food Club Representative will be on hand to educate attendees about the benefits of healthy snacks in their homes, schools and businesses. All who visit the booth will be given a medley of snacks and coupons to use locally to purchase the products they have tried. Organic Food Club has been a grass- roots effort spawned by Ed Kugler of Linconwood Illinois to provide healthy snacks to his now grown children instead of vending junk food offered them at school. From sprouts to the latest in innovative snacks and raw cacao (chocolate with health benefits), to the best salsa Ed boasts that you can taste it all before you buy- a great benefit to the consumer. In many cases, the experience offers coupons and the occasional swag including discounts, magnets and handouts. We have been a part of several events in California including Bu-Fest in Malibu and Harmony Festival. OFC has also been participating in Green Festivals for the past three years and boasted attendance in Seattle, Denver, and Chicago. During our events we evoke the local community to play a part in the role from the 25 staff to local companies. Often times we allow healthy chefs to boast creative skills in applying panache to a few of the ingredients. These chefs are also involved in the community and are found from Environmental chef services www.1ecs.com One ECS chefEvan Rotman of Oaklandstated he was unaware of the healthy alternative to cheese (found in Lisanattii) melting properties and hopes to use it for his clients. The mission of Green Festival is 'to inspire and inform as many people as possible to help make our world more just and sustainable' and features over 300 exhibitors and 125 visionary speakers and experts on the most pressing environmental, social and personal issues of our time. Highlights are speakers Thom Hartmann, the nation's #1 progressive radio talk show host, Amy Goodman, host of Democracy Now! and Dolores C. Huerta, Co-Founder of the AFL-CIO. Special features of this year's Green Festival are live music performances, fashion shows, presentations, demonstrations, workshops and more. Healthy Living Expo - Getting Greener! Yes we are GETTING GREENER!Join health and earth conscious individuals for a morning of fitness activities including our traditional fitness walk, continental breakfast, recycle and reuse education, document shredding event, electronic recycling, clothes recycling (GREAT CLOTHING EXCHANGE) and so much more. Chef Daniel will join us again to discuss local farms and the bounty of Colorado and the merits of choosing produce sourced locally vs. internationally grown organics (as discussed in The Omnivores Dilemma by Michael Pollan). Green product samples and healthy food samples will be given out. PR Log (Press Release) Apr 06, 2010 On Saturday, April 17th, Old School Square (OSS) celebrates its 6th annual Circle on the Square fundraising party, at the Old School Square Pavilion, in support of the Delray Cultural Center. This year�s theme is Martinis & Motown. The event draws patrons from all over Palm Beach and Broward Counties. The ultimate goal is to raise money to support the arts education and cultural programs provided by OSS to the community. Florida Builder Appliances, a Silver Sponsor of this year�s event presents private chef, Chef Irie Spice in a series of three cooking demonstrations utilizing their top of the line Viking Appliances. This culinary demonstration with sampling promises to tickle the palette of all the local foodies and wine connoisseurs attending this year�s major fundraiser. Advance tickets start at $90 general admission and $120-VIP (inclusive of gift bag and exclusive access to the VIP lounge); all are available online at the OSS website: http://www.oldschool.org/circleonthesquare.asp or call 561.243.7922 ext. 1. Prices day of event are $125 gen. adm., $150 VIP. Event time: 7pm � 10:30pm. In addition to Chef Irie�s cooking demos, eighteen of the areas� top restaurants, accompanied by Sundy House, the Marriott Delray Beach along with Southern Wines and Spirits will be on hand providing sampling opportunities of their fare. Visitors will can �Sip International Wines and Liquors�, �Sample Delray�s culinary delights & desserts� and �Savor a night out with Friends�. It promises to be a fun filled evening full of music and philanthropy all in support of the arts. Chef Hugh Sinclair is a South Florida resident with Caribbean roots that hail from the island of Jamaica. He is a Certified Culinarian who has a passion for food and a taste for great service. 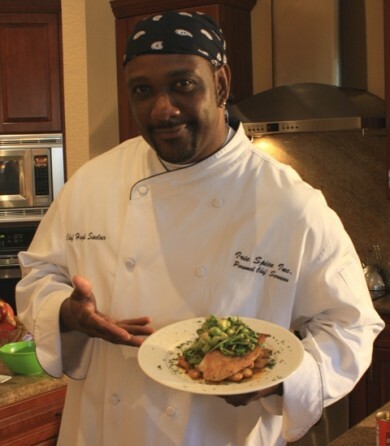 A culinary graduate of the prestigious Johnson and Wales University in North Miami Beach, Chef Hugh�s experience working for the likes of Turnberry Isle Resort, Bimini Boatyard and other top notch establishments formed his unwavering commitment to deliver great food and service at the highest possible level. For further information about Chef Hugh please visit http://www.iriespice.com. Old School Square Cultural Arts Center, located in the heart of charming downtown Delray Beach, was created thanks to the determination of a local group of citizens who saved the 1913 Delray Elementary and 1925 Delray High School buildings from demolition after they were abandoned by the Palm Beach County School District in the mid 1980�s. �Over $7 million was raised to restore and re-adapt the facilities for use as a museum and theatre. The center is on the National Register of Historic Places and serves as a gathering place for the community. Old School Square was the catalyst for the redevelopment and revival of downtown Delray Beach. The center was featured in a presentation at the Smithsonian Institution for National Leadership Forum on "Culture Builds Communities"
and was singled out as an exemplary model of a community that used the arts to institute a positive change in the community. For further information on Old School Square please visit http://www.oldschool.org. life safety, the environment, ADA and sustainability. Each year our City Center donates a portion of our proceeds to a local non-profit organization. This year we are proud to be partnering with Tulsa CASA, Court Appointed Special Advocates. donating TWO playhouses, doubling last year�s contribution! What does the event look like this year? plan to be entertained and enjoy this magical evening. PALO ALTO, Calif., January ___, 2009 Calafia Cafe & Market A-Go-Go, the eagerly anticipated new restaurant and market from founding Google executive chef Charlie Ayers, will open its cafe side on Tuesday, January 20. Ayers is known for his "slow-food-served-fast" approach to cooking, which put Google's cafes on the culinary map. His healthful and delicious creations have been enjoyed by Mikhail Gorbachev, Bill Clinton, Queen Noor of Jordan, Robin Williams, U2's Bono and the Edge, and many other notables. Calafia's to-go market will open in February. Calafia offers a fresh, affordable approach to dining on the go, with a casual, sit-down cafe, full-service bar, and grab-and-go market, all under one roof with indoor and outdoor seating for up to 102 guests. Calafia represents the culmination of Ayers' belief that food can be healthful and budget friendly, while at the same time, fast and flavorful. Most menu items will range from $4.50 to $12.50, with dinner entrees costing up to $18 after 5 p.m.
"Calafia is the manifestation of my long-term vision to 'go public' with the concept I created at Google," said Ayers. "In fact, my staff is made up largely of cooks who were on my team at Google, and we're excited to be working together again." In keeping with Silicon Valley's reputation as a technology leader, Calafia will use handheld, wireless POS systems for table-side transactions and self-checkout kiosks to speed order and payment processes for busy diners. Guests may order via the web and pick up via designated parking spaces. Calafia's market will feature an organic salad bar and pre-made, grab-and-go items, such as sushi, wraps, salads, sandwiches and drinks. Made-to-order market items include smoothies, sandwiches and salads. Also available: customized party platters and pre-cooked meals sealed in plastic, ready to be reheated at home in simmering water. Ayers has also assembled a selection of specialty retail items. From 3-5 p.m. and 8-10 p.m. daily, Calafia will offer a discounted beer and wine menu with selections designed to pair with specific bar menu items. One menu item will be offered at a discount during the happy hour periods. Reflecting Ayers' commitment to protect the environment, Calafia was designed and constructed with sustainable and recycled materials throughout. Notable design features include ceiling treatments, accent walls and signage made with reclaimed wood from a 1910-era Pennsylvania barn, original heavy posts from an old railroad bridge in Northern California, and in the front dining area, a custom chandelier constructed of 66 amber milk bottles found on a dairy farm. Calafia follows the Monterey Bay Aquarium's Seafood Watch guidelines and will use only free-range, organic poultry, grass-fed beef and lamb and Berkshire pork. Menu ingredients contain no growth hormones, antibiotics or harmful additives. The restaurant plans to source the majority of ingredients from within a 150-mile radius, working with the Capay Valley Growers partnership of 23 farms, including Full Belly Farms and Wind Dancer Ranch. Blue Moon Organics in Aptos is another local source. Other eco-friendly touches:� exclusive use of gas ovens for cooking pizzas; biodegradable packaging and flatware in the market; restroom dryers that dry hands hygienically in mere seconds; and use of fluorescent lighting in some areas. Calafia will use a reverse-osmosis water filtration system to provide flat and carbonated water at no charge; the only bottled water sold on premises is One Water, a brand that puts all profits toward building systems that provide free, clean water to communities in Africa. Calafia is located in Town & Country Village at 855 El Camino Real (at Embarcadero Rd.) in Palo Alto, Calif. It is walking distance from Stanford University. Calafia's cafe and bar are open daily for lunch and dinner from 11 a.m. to 10 p.m. No reservations. Phone: (650) 322-9200; www.calafiapaloalto.com. This past September, I was asked to participate as a judge for a Taste TV Chocolate Salon that allowed us (and the general public) to taste chocolate from local and national providers.It was a great experience (I mean, how bad could it be to eat every kind of chocolate imaginable?). The last booth I visited was Mayana Chocolates, created by chocolate artesian and chef Daniel Herskovic. Had I known the treat that I was in for, I might not have visited other booths! Herskovic has been trained as a classic chef at the California Culinary Academy.In 2004, he started a private chef business and then expanded in 2006 to launch a catering company called Sakura Private Dining.He started to study and take chocolate workshops at the French Pastry School and The Notter School of Pastry Arts in Orlando. After his formal training, he decided to incorporate his chocolate creations into the catering business by offering clients boxes of chocolates.After winning high praise, he launched Mayana Chocolates in 2008. Because Chef Herskovic is both an artesian and a perfectionist, he only uses the best chocolate base product.These ingredients include Swiss, German, French and US made chocolate. He said, "I look for a chocolate that can be a blank canvas." Approximately 75% of his creations are made with dark chocolate.His contention is that people tend to overeat milk chocolate offerings, but can be satisfied by eating only one piece of dark chocolate.So, I put him to the test with his own chocolate.I ended up having three pieces and then closed the box and moved it to another room. For the holiday, Mayana Chocolates is selling a 16 piece collection for $37.Yes, I did have to sample these just to make sure they were as yummy as I remembered. My personal favorites are the Fleur de Sel Caramel, Creme Brulee Ganache, and Carmelized Peanut butter and milk chocolate ganache, Passion fruit ganache honestly, I love them all.I would have MANY more friends if I carried a box of these chocolates with me all the time. In addition to selling his chocolates for holidays such as Christmas and Valentines Day, he packages many of them for weddings and showers.Mayana Chocolates have also been created special for corporations with custom logos and slogans.They recently produced some for Barack Obama's presidential campaign. Mayana Chocolates can now be purchased via paypal by clicking on this link:PURCHASE NOW! One evening in mid May, dressed in formal white restaurant attire, Alex Forsythe and a small cadre staff of sous-chefs arrived at the Linnaeus Teaching Center at Woodward Park in Tulsa Oklahoma. They came to offer their services to Bellenda Possie and Friends. They rolled in crates of squash blossoms, Colorado lamb, Alaskan halibut, organic local mushrooms from Planet Mushroom, and enough fixings for a five-course feast to help thank those whose donations and contributions support the second anniversary of the Linnaeus Garden. exquisite, memorable meal we've ever had,"
As Chef Forsythe worked at the induction burner from a well-equipped road case across from the stewards' station as the guests mingled in the foreground. It was the ultimate open garden kitchen experience. ECS chefs have catered at more than a score of home parties this year, in Colorado,San Francisco, the Caribbean, and in Tulsa. Demand for this type of intimate dining is becoming very�popular.� Due to the interest for in-home dining, Chef Forsythe� his caudre developed� collaborative chef services three years ago, ECS www.1ecs.com.� "People love the idea of an ECS chef coming to them�and being the entertainment", Chef Forsythe said. "It's an extraordinary undertaking to do these dinners and the patrons feel� the synergy of a unique presentaion of the chefs talent in this venue of the the site for whom the donation was extended. Attention Iron Chefs. Here�s a challenge for you. Try putting together those beautifully prepared and eminently eatable dishes in a kitchen the size of an apartment closet, with just enough counter space to open a can of soup. Or take a shot at whipping up a souffl� at 8,000 feet, or building an intricately stacked entr�e at the same time you�re creating a sauce, grinding coffee beans and serving drinks to a dozen demanding passengers. And do it all with no sous-chef and no assistants, a microwave oven that looks as if it belongs in the local convenience store and a convection oven barely large enough to accommodate a couple of plucked pigeons. Welcome to the galley of a typical large business jet, where food preparation and any form of cooking is always a challenge. Despite the limitations of the galley, more and more passengers are �foodies� who expect the same quality and service at dinner in their $30 million business jet that they got last night at Chez Panisse in Los Angeles. Bombardier chief flight attendant Debbie Franz is also acquainted with this growing demand for in-flight meal preparation. Franz manages the flight attendant staff of five for Bombardier�s demonstrator aircraft fleet in Hartford, Conn. Included in her budget is funding for culinary training, from menu planning and ingredients to the pairing of wine and foods and advanced saucing. Some flight attendants have attended a special two-day advanced course in menu planning and culinary skills offered by The Corporate School of Etiquette. One recently attended a class on Indian cuisine. Franz herself has attended courses at the Culinary Institute of America (CIA) in Hyde Park, N.Y., and hopes to send a number of flight attendants from her staff to specialized courses at the prestigious school this year. More and more flight attendant r�sum�s list culinary skills, she said, from being a certified chef to having at least some training in food preparation. Holly Sirois is a flight attendant with more than the usual culinary expertise. She has worked at small restaurants, owned her own restaurant for a while, and worked at the former Rita�s Catering in Boston before becoming a flight attendant. Today, she is an independent contract flight attendant who can list among her accomplishments preparing and serving an in-flight meal on an airplane whose passenger list included Food Network star Mario Batali. Her last full-time position was managing in-flight services for Flightworks in Kennesaw, Ga., where she launched a culinary training program for the flight attendant staff. With the limitations of the typical business jet galley, she said, in-flight food preparation is a balancing act that requires a high level of organization. She does as much of the work as possible in advance, either in a kitchen before the flight or by arriving at the aircraft early. Joe Botelho, a full-time flight attendant for The Drax Group�s flight department in Naples, Fla., agrees. He does his in-flight cooking in a Global Express, the galley of which he designed to his own specifications. Botelho learned to cook at a resort in Italy and owned a restaurant in Florida. A former Portuguese Air Force flight engineer, Botelho in his current job combines his two great loves�flying and cooking. Like Sirois, Botelho cleans and prepares everything possible before the flight, slicing and dicing, roasting vegetables and searing beef or chicken. Kendra Wilcox is a chef whose �Southwest French Fusion� cuisine emphasizes low sodium and reduced saturated fats and cholesterol and uses her personal blend of seasonings and fresh herbs and spices. Her kitchen near Telluride, Colo., is 9,000 feet above sea level, so she is familiar with cooking in an airplane cabin pressurized to 8,000 feet. It�s an environment, she explained, in which a potato wrapped in foil would bake in two hours, more than twice the time required at sea level. While culinary education and experience is valuable, food preparation on the business jet has its limitations, determined for the most part by the galley. On even the smaller bizliners, such as Embraer�s Lineage 1000 or the Airbus A318, galley space is rarely an issue and there is typically room for such �luxuries� as a refrigerator, a trash compactor and a full-size oven and warming drawers. But smaller business jets, even those the size of a Global 5000 or Gulfstream G550, are rarely so well equipped. Susan Friedenberg, president of Corporate Flight Attendant Training and Services in Philadelphia, believes the galley of the typical business jet is simply not designed for on-board food preparation, and particularly not for cooking. This might be surprising since some aircraft are capable of flights of 14 hours and more, during which time passengers expect multiple meals. �Unless the galley was designed for cooking, don�t,� she advised. Wilcox concurs, �Don�t even try to cook from scratch in a business jet cabin,� she warned. Doing as much food preparation as possible on the ground to minimize the work in the air is the key, she added. �While there are certainly limitations to the in-flight preparation and cooking of meals, it appears culinary training for flight attendants is becoming more common. Business aviation caterers are becoming a typical source of such training. According to Paula Kraft, owner of Tastefully Yours catering in Atlanta, �the bar has been raised in terms of the culinary expectations of business jet passengers� and, as a result, flight attendants in growing numbers are spending time in her kitchen to learn various culinary disciplines. Other business aviation catering kitchens also offer some degree of culinary familiarization and training. Casacchia keeps her advanced culinary classes small, no more than a half-dozen students at a time, and she has a waiting list. The $1,600, two-day course is taught by a trained chef and covers considerable ground, from saucing techniques to menu planning. It is typical for the chef to use a single basic ingredient, such as spinach, as a teaching tool for an entire day, incorporating it into crepes for breakfast, salad at lunch and mashed potatoes at dinner. Sources for culinary training are varied, from such formal settings as The Culinary Institute of America to the more intimate one-day classes offered by A Store for Cooks in Laguna Niguel, Calif. Many colleges and universities offer culinary classes, and wineries often feature classes on the pairing of wines and foods. The CIA, in fact, offers a three-day course designed specifically for corporate flight attendants. Training includes such subjects as holding and reheating food, product identification and knowledge, knife cuts and exceptional in-flight service. Classes� are held at the institute�s Hyde Park campus. The next courses are scheduled for February 12-14, March 26-28 and May 13-15. If in-flight food preparation and cooking is called for, so is a course in food handling and safety. While dining is one of life�s more exquisite experiences, Jean Dible of Georgia Food Safety Professionals in Atlanta warns, �food also kills.� Dible teaches a one-day course in food safety designed specifically for company employees involved in food handling and preparation. Is in-flight food preparation and cooking just a phase propelled by growing interest in the culinary arts? Or is it something more long-term created by business jet passengers who, once weaned off fast food, have no intention of going back? Flight attendants, chefs and even business jet cabin designers are betting on the latter. So as passengers become more demanding, flight attendants are becoming more attuned to the culinary arts, chefs are adapting to the limitations of the cabin and aircraft interior designers are creating galleys more suited to on-board food preparation and cooking. In-flight Meal Preparation and Cooking: How Safe Is It? More and more flight attendants have some culinary training, and business jet galleys are increasingly designed for at least minimal in-flight food preparation and cooking. All this is in response to demands by �foodie� passengers who more than ever expect the best catering, and many flight attendants are now doing as much of the meal preparation as possible at home, from washing and dicing and slicing to searing and par-boiling. But is it safe? That�s the question some in the business aviation industry are asking�with good reason. Jean Dible of Georgia Food Safety Professionals in Atlanta has some of the answers. Dible teaches food safety training, a one-day course available to corporate flight departments, charter operators, fractional operators, FBOs, caterers and others in the business aviation community. For those who do not take the specter of food poisoning seriously, Dible points out that food-borne illness is responsible for more than 5,000 deaths a year in the U.S., and that contaminated food puts more than 325,000 Americans in the hospital each year. The food-borne outbreak risk to any individual or corporation owning a business aircraft is �tremendously increased,� said Dible, because the majority of business aviation employees who handle or order food have not been properly trained in food safety procedures. Food preparation and transport for commercial purposes is strictly regulated in all 50 states, and for a flight attendant to prepare food in her kitchen at home for passenger consumption later is illegal. Food-borne bacteria, said Dible, is multiplying in protein foods during the period it is being transported from the shop to the home, continues to multiply during preparation, during transportation from home to the aircraft (if it has not been properly chilled) and during storage on the airplane (if there is no proper refrigeration or chilling unit). Susan Friedenberg, the owner of Corporate Flight Attendant Training and Services in Philadelphia, does not offer culinary training, but she does emphasize safety in food handling as part of the cabin services syllabus. Nashville, TN. � Celebrity Tablescapes, the T.J. Martell Foundation's inaugural event that matched designers with celebrities to create elaborate table settings reached an entertaining success by raising more than $35,000 on Monday, September 25 and Tuesday, September 26, 2006 at the Hilton Nashville Downtown. The event featured twenty-one lavishly decorated tables each with a unique theme including some that carried through the celebrity touch. Designers were asked to meet a criteria in building their tablescapes design such as having a place setting for eight, decorated chairs (to fit the theme of the table), fresh florals (if using floral arrangements), place cards, party favors for each guest and a recommended menu designed by a chef. Some tables included celebrity autographed memorabilia for party favors, song title table themes, celebrity clothing as chair covers and celebrity inspired artwork as placemats. To create a bit of fun competition, the tablescapes were judged by a judging committee headed by Anita Baltimore, FASID and national past president of the American Society of Interior Designers. Three awards were given during the V.I.P. Reception on Monday night. The winner for the Best of Show Award was presented to Jennifer Reguli and Sarah Martin of Bradford's Interiors-Obelisk who partnered with actress Lisa Hartman Black to create the theme of Elegant Glitterati. The "Friends of the Zoo" was the tablescapes that received the Best Theme Award presented to Joyce Jones of BBJ Linen and Mike Whitler and Mark Weber of Branches who partnered with CMT on-air personality Katie Cook. The Most Creative/Whimsical Award was presented to Jason Parker Counce and Susie Gianikas of Color, Inc. whose Butterfly Passion themed tablescape was inspired by Dolly Parton. The judges added an Honorable Mention award to Sandra Wong of Bryson Studios and Leslie Bilbrey of Green Resources for their creative celebrity inspired Brenda Lee's "Rockin' Around The Christmas Tree" tablescape. "Celebrity Tablescapes gave patrons the opportunity to attend a unique event, see extraordinary entertaining ideas and help raise vital dollars for cancer research through the T.J. Martell Foundation," said Dr. Priscilla Partridge de Garcia, Co-Chairman of the event. "The event brought together many talented and giving people." One of the highlights of the evening was the live auction of the fully designed tables. Some tables included full table settings, trips, gift certificates, tickets to events such as Tennessee Titans football games and items such as luggage and spa treatments. Design consultant Lynn Baker offered the Premier Live Auction table that was inspired by Capitol recording artist Trace Adkins and his wife Rhonda and included Continental Airline tickets, a trip to the Cal-a-Vie Spa in Southern California, a dinner for twelve prepared by Executive Chef Alex Forsythe and a chocolate tasting by Sophia Rea Chocolate Source. Celebrity Tablescapes was presented by Nashville Lifestyles and sponsored by AdVerb Design, Continental Airlines, Educational Media Group, Michael Collins Irish Whiskey, Gibson Guitar, Lipman, the Nashville Chamber Orchestra, Robinson Graphics and the Vanderbilt-Ingram Cancer Center. Clear and Calms. Gin and Goslings Rum with Native mint. I really recommend that you consider designing small dishes for your guests and also keeping your menu items small to enjoy picnic style under umbrellas or trees as you fight the heat to enjoy the PGA said Chef Alex Forsythe. "The Chefs at ECS travel around the world and are always prepared for any type of weather and have a deep concern for our environment." For ten years, Executive Chef Services (ECS) has served as a chef-based referral service whose website allows clients to find the perfect professional chef for any occasion or location. Chef Alex Forsythe and the chefs of ECS know and appreciate the signs of global warming and understand the need to "go green" while remaining on the cutting edge for culinary delights. ECS chefs went "Green" in order to support the local farmers and provide the freshest quality produce for their menus. These high caliber chefs care about the clients and are paying more attention to the carbon footprint of every meal they create wherever they create it. Chefs at ECS are also starting to offer "Environmental Chef Services," providing environmental and social awareness alongside their usual creative and quality gastronomical services. In addition to incorporate these values into their day-to-day lives and work, chefs Jody Kropt, Alex Forsythe, RJ Harvey, Daniel Herskovic and Daniel Asher will be participating in the "Eat Well Guided Tour of America," which is run by the non-profit organization Sustainable Table. with Abram with create a theamed Rock star dinner menu for headliners. designers, nursery owners and sustainability activists. about learning to live better on the planet and we walk our talk. participates in creating a healthy scene and better informed audience. and artists at the Harmony Festival. We offer two booth options, Dedicated or Co-op table-space. We create a flier; it includes your logo, mentions the sample products, your website, information on the importance of organic/natural foods, and local organic/natural food retailers. We offer it to everyone who approaches our booth, and post a link on our website. We will also handout info and coupons for your company. > > Executive Chef Services (ECS) launches as "Roundtable" of talent! > > for your next dinner party or big event. > > vision is turned into a reality." > > for Celebrity Tablescapes, an event in Nashville at the end of September. > > Winery in Napa Valley and will be hosting a James Beard soiree this fall. > > September 10 th and ECS lists her dates and times for future locations. > > information on events and worldwide opportunities. > > services to a wider public" said Chef Alex Forsythe, the founder of ECS. > > we learned about this round table of talent just by surfing the web!" > > needed, ECS can provide carbon off set assessment through neutral catering. "You're a true food artist with much respect and admiration."